ShopMoreApp is not an application most users would identify as a serious threat; however, this is a mistake. You cannot underestimate the risks related to this program; otherwise, you will put your own virtual security at risk without even realizing it. Needless to say, we believe it is necessary to delete the application if it has been installed. Do you want to learn why ShopMoreApp removal is so important? Not many computer users are aware of the official ShopMoreApp download page shopmoreapp.info. Why? The download link is inactive, and it is unclear whether this link has not been activated yet, or if it has been already deactivated for some reason. Overall, this is suspicious considering that CouponBuilder, CouponTime, SaleBuilder, and other ShopMoreApp clones that also require removal are represented in the same manner. All of these programs have been built using the Justplugit engine; however, it is unknown whether the developer of these programs is the same. Of course, this would not be surprising. Are you familiar with the parties promoting ShopMoreApp advertisements? It is most likely that you are not, primarily because parties linked to ShopMoreApp do not want to be identified. Advertisement-supported programs like this one are usually employed by parties who have no other ways to promote their suspicious deals, installers, and other offers. Unfortunately, the parties related to adware could be mischievous. Do you want to be introduced to unreliable ads when browsing the web? If you don’t, you must delete ShopMoreApp right now. 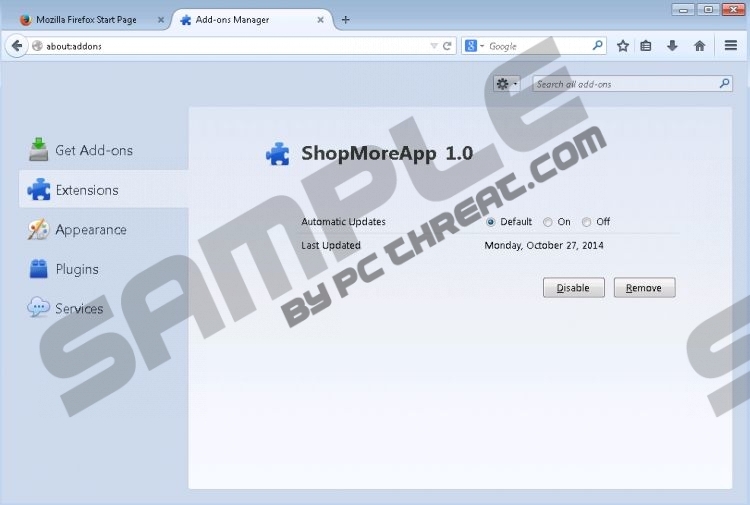 Click the download button and install a tool which will delete ShopMoreApp automatically. We recommend using this removal option because it alleviates the removal of other running threats as well. If you are sure you can identify and delete all threats running alongside ShopMoreApp yourself, you can try to remove the application manually. The instructions below will help you uninstall the undesirable application from the Windows operating system and the affected web browsers at the same time. Right-click the app you wish to delete and click Uninstall. Right-click on the Metro UI menu screen. Select All apps and then click Control Panel. Quick & tested solution for ShopMoreApp removal.